I awake to pounding at the thin wood door of my jungle hotel. Opening it, groggy, I find a slender woman in a gray dress standing there. Her hair is wet. “The mayor is waiting for you. You have to see him at 8 o’clock,” she says, in a mix of English and Spanish. “¡Levántate!” calls out my roommate, Juan. 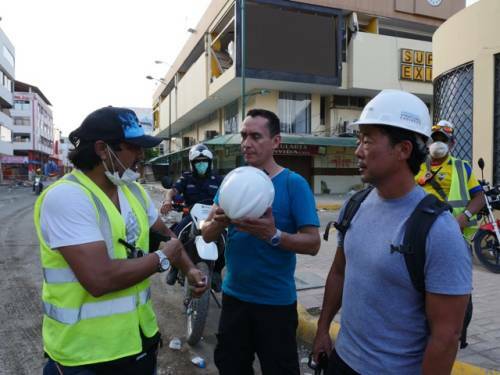 We had no prior contact with the mayor of Portoviejo, one of the worst damaged cities in Ecuador. But this is how it always starts. A call. We meet at the radio station next door to the funky, thatched-roof lodgings we call our “hotel.” While right next to the modern downtown, it’s more like a commune in the jungle and many of the guests seem to live here. Guests are a mix of stranded locals and international aid workers. 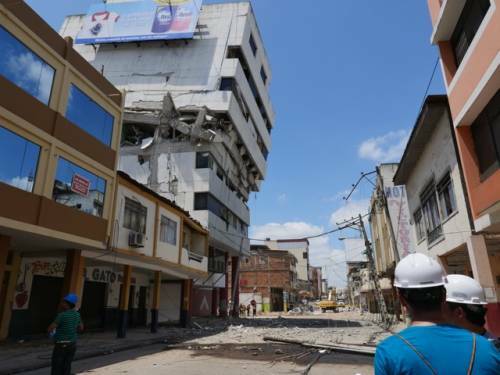 Nonetheless, with its strong Ecuadorian coffee in the morning, cold local beer at night and spotty Internet, it’s a haven of sorts in the midst of this urban earthquake disaster. He is quick and direct: “I need your advice. I think our engineers are doing a good job, but I want to compare our findings to another expert opinion. Some tell me most of the buildings need to be taken down. I want to know if it is true or if my town can be saved. If you tell me we need to take everything down, I will. But I need to know.” He promptly sends us to the city’s former airfield, now a staging area for orange-vested disaster first responders. Stern, husky policemen motion us through barricades to a small area where a flank of officers stands in neat lines. Their superior shouts out an explanation of who we are and our mission. Two officers step forward to volunteer, one more senior than the other. They introduce themselves with curt nods and broad smiles. Portoviejo’s once vibrant downtown with 223,00 souls is now a fenced-off, 40-block Red Zone. Over 200 people died here when the earthquake hit at 7 pm on a Saturday. I look out into the street ahead of us. A broken, 8-story tower tilts precariously over the debris-strewn street like the Leaning Tower of Pisa, only infinitely more dangerous. It could collapse at any minute. Scores of stairs are climbed. Eight floors. Three floors. Ten more floors to the terrace, my “earthquake shoes” crunching on fallen plaster, bricks and glass, headlamps needed to pass through the darkness. I essentially own one pair of shoes: Ecco shoes. I use them for everything from responding to disasters to meeting prime ministers – after cleaning them up a little. They are perfect for my luggage: small. We enter Portoviejo’s badly damaged Municipal Building, which includes the mayor’s own office. Gaping holes replace entire walls, especially in the stairwell, which looks like a war zone. It looks like a gigantic explosion happened there. Entire offices hang open to the outside world – desks, filing cabinets and coffeemakers hanging on for dear life. It looks terrible, but the truth is, this is all repairable. The concrete columns remain intact. None of the damage, although substantial, is structural. As we leave, a young man in a bright blue shirt runs across the street to intercept us. “I hate to bother you, but…” Can we assess his school? Classes for 400 students are supposed to start in a few weeks and no one knows how to move forward. Can we look at the damage? It would be so appreciated. Downstairs, the few cracks are superficial and the concrete columns are solid. Upstairs, the interior wall damage is horrifying. 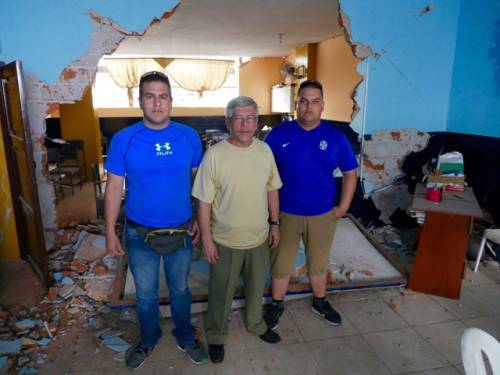 A brick wall dividing classrooms fell and smashed the desk of a teacher and some students. What if it wasn’t Saturday? What if class had been in session? This could have been 10 am on a Monday. We venture deeper into the Red Zone. Heavy machinery with mechanical claws pull down entire buildings. We pass a communications company flattened by the earthquake. The mayor summons us via our trusted police companion, Officer Zambrano, who is armed with a walkie-talkie. We begin to leave when another desperate person approaches, pointing to his building. It looks undamaged except that the entire fourth level of the building next door toppled onto his roof. The police want us to go, but, like always, I want to help this man. We crunch upstairs through more glass and plaster. Inside, is a beautiful apartment with impressive furniture. Next to the bed sits a photo of the man and his kids. He opens a back room where toppled building has punched through six inches of concrete and buried its head in his ceiling. It hangs by steel threads. And yet his structural system is intact. I tell him, “This is all repairable. Your main structural system is intact.” He sighs, relieved, and smiles widely. He sees the direction and hope now. This is what people need in a disaster. We arrive at a campus that has become a command center. Dell computers, copy machines and paper cover every surface. They bring a young planning director to us who immediately, rapid-fire, spends eight minutes spelling out everything they’ve done and plan to do. He’s very intelligent and motivated. I compliment the job they are doing; their organization; the maps showing damage. “But you have this huge red zone going on,” I say. “This could prolong reconstruction and really hurt your downtown, perhaps indefinitely.” I brought up Italy 2008 and Christchurch 2011, where the city barely exists anymore. Too long of a red zone is not a good thing. The Vice Mayor shows up unexpectedly. I tell him the same story. “Government alone can’t fix this town. The private sector must carry the majority of the burden of recovery and reconstruction. If the government helps private owners to do their job, they will do it. “¡Andale!” he says. “This is exactly what we are thinking.” He already had a plan to shrink the red zone, but unsafe areas caused by falling buildings and objects must be identified and cordoned. 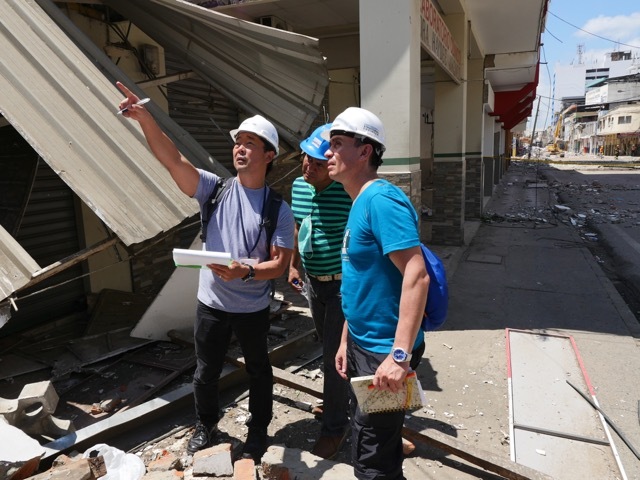 To me, this is the heart and soul of disaster reconstruction: work with locals to build their capacity, so they can do it. It is a subtle, but crucial, strategy. 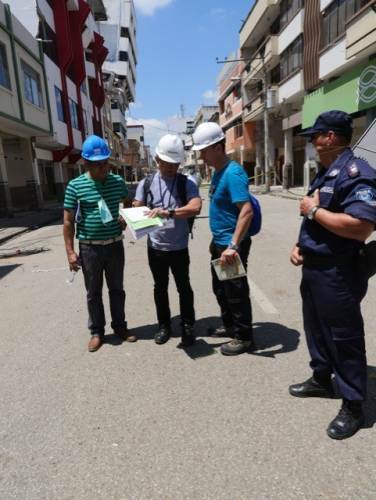 Building capacity in disaster-stricken communities creates jobs and the knowledge base. We lose so much in disaster. Why not add something back?